To meet the business imperative for enterprise integration and stay competitive, companies must manage the increasing variety, volume and velocity of new data pouring into their systems from an ever-expanding number of sources. They need to bring all their corporate data together, deliver it to end users as quickly as possible to maximize its value, and integrate it at a more granular level than ever before—focusing on the individual transaction level, rather than on general summary data. As data volumes continue to explode, clients must take advantage of a fully scalable information integration architecture that supports any type of data integration technique such as ETL, ELT (also known as ETL Pushdown), data replication or data virtualization. 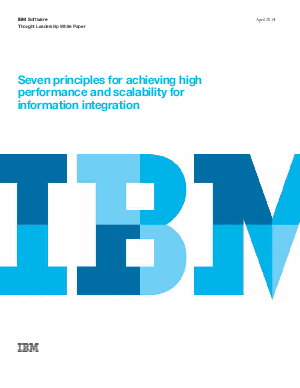 Read this new whitepaper to learn about the seven essential elements needed to achieve the highest performance.